This post includes vivid descriptions of anxiety and panic attacks. 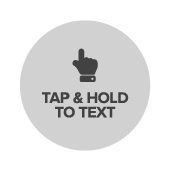 If you need help text a trained volunteer at 741741 or click the mobile text button below. Anxiety: for some people, it hits like a ton of bricks. Sometimes, it’s related to a specific trigger or event in their life, and goes away after the stressor is removed. But for many people, anxiety is a long-term battle they fight every day. It can manifest itself in subtle, unexpected ways, outside of the stereotypical sweaty palms and racing thoughts. Many people experience a variety of physical symptoms with their anxiety. My anxiety feels like when you’re running down the stairs, and you miss a step and think you’re going to fall. Or when you’re on a rollercoaster, climbing a steep hill and looking down over the drop. That mini-heart attack is how I physically experience anxiety on a daily basis. First, my heart starts racing. Then, I notice it becomes harder to take a breath. My chest feels heavy. When describing this to others with anxiety, many of them can empathize. Sometimes this sudden rush of adrenaline is related to some sort of trigger such as walking through a crowd or speaking to a large group of people. But the thing about anxiety is sometimes, it may happen for no reason at all. I’ve experienced the same sense of “danger” just sitting in my bed reading a book as I do going through a haunted house. Some of the more severe physical symptoms of anxiety include tension headaches, nausea, stomach aches, and chronic pains. If these symptoms become serious, you should see a doctor or medical professional. Symptoms like these can make it difficult to complete your daily routine. It’s hard to sleep when your thoughts are racing. I’ve spent many nights tossing and turning, worried about something I had to do at work the next day, a paper I had to write, or the list of chores I needed to complete. This type of anxiety can often begin in childhood: staying up at night worrying about tests, bullies, family drama, or a big game. When I do finally fall asleep, I often find myself waking up frequently to worry about whatever’s on my mind. Sometimes, it even follows me into my dreams. Those with severe anxiety may experience nightmares, which can decrease their quality of sleep. It can also make it hard to enjoy “quiet” activities (such as reading or meditating) because an anxious mind wanders to other places. The physical symptoms of anxiety are sometimes so debilitating that it is hard to leave the comfort your own home. As a result, you may also find yourself avoiding social activities. This type of anxiety, wherein anxious symptoms result from interacting with other people, is called social anxiety. Anxious people with introvert personalities may experience an emotional “hangover” after a lot of human interaction. This can include feeling particularly tired or irritable, and needing rest after time with others. For example, I deal with people frequently in my job, and due to my anxiety I need time to “recharge” and unwind. So, I’m not typically the kind of person who often goes out with co-workers or friends after interacting with people all day at work. I need that time to refresh and prepare for another day. Anxiety can make it difficult to focus on just one task at a time. I often find myself bouncing back and forth between typing a paper, catching up on work, scrolling Facebook, and clearing out emails. Sometimes, anxiety will make me feel guilty for doing one thing and not another. Then when I do that one thing, I feel guilty again for not doing something else. It’s a vicious cycle. Sometimes, small things can be overwhelming or triggering when you’re feeling anxious. If you find yourself crying more easily or becoming irritable, angry, or annoyed faster than you used to, you may be experiencing some underlying symptoms of anxiety. Take a step back and think to yourself: What’s going on in my life right now? What am I particularly worried about, and/or what is causing me stress? Anxiety can cause you to need to control the people and situations around you. Even if you don’t have the typical “Type A" personality, you may experience obsessive overplanning and overthinking. This is our brain’s attempt to create order in perceived chaos by focusing on the things we can control. For example, if you’re anxious about a job interview, it’s much easier for your brain to focus on controlling how the pillows are arranged on the couch than to think about the interview. These symptoms are somewhat related to being a “control freak.” Anxious people tend to be perfectionists. There's an underlying urgency to get things done because of the “fight or flight” signals being triggered in our brains at any given moment. We often worry if what we’ve done is good enough, and tweak our work (or our words) until we drive ourselves crazy over it. We may struggle to delegate to others in fear that something might not be done in the way we want it to. We often spread ourselves thin and have unrealistic expectations of what we can actually accomplish. In our minds, we have to “do it all.” These behaviors can appear in the form of intensely studying for a test at school, obsessively training for a sport, or agreeing to take on extra projects at work, even if our schedule is already full. Anxiety is different for everyone, and you may find that you experience some - or even all - of these unexpected symptoms. If you’re experiencing anxiety and need support, Crisis Text Line is here to help. Text “HOME” to 741741 for free, confidential help, available 24/7. Hannah Emmett has been Crisis Counselor with Crisis Text Line since 2015 and also assists with volunteer training as a Coaching Assistant. Her passions include sharing her experiences with anxiety, educating about mental health, and reducing the stigma around mental illness in the workplace (particularly in military communities). Hannah served as the Chapter President of her university’s Active Minds club while in college, and holds a B.A. in education.